First of all, how does one know it’s the spleen that is hurt? Abdominal pains and chest pains are hard to diagnose without a complete investigation of whatever is ailing the patient. Any pain that is felt by the patient specifically in the upper left side of the chest may be commonly associated with diseases of the colon or the spleen. If the pain is nearer to the ribs, then the organ affected may be the spleen. The spleen may be enlarged or may be the seat of an infarction. How big should my spleen be? 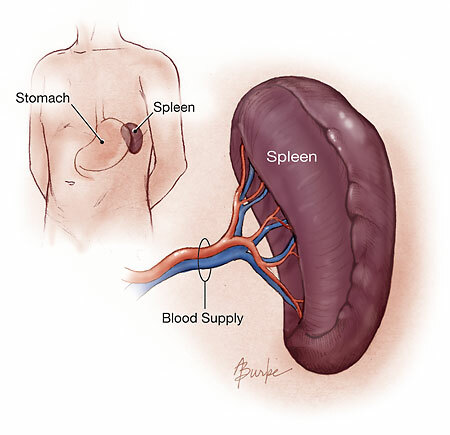 Normally, your spleen is about the size of a fist, but a number of conditions from infections to liver disease and some cancers can cause an enlarged spleen, or splenomegaly. Sometimes, a person with an enlarged spleen will not show symptoms. The condition is often discovered only during routine medical examination. When the doctor finds out about it, the patient is required to undergo imaging and blood tests to determine its cause. What can cause the spleen to swell up? An enlarged spleen may begin to filter normal blood cells aside from abnormal ones, which can reduce the number of healthy cells in the blood. It can also trap blood platelets, which eventually will clog the spleen and interfere with normal functioning. An enlarged spleen may even outgrow its own blood supply, which can damage or destroy sections of the organ. Although people with an enlarged spleen generally feel no pain, they have reported feeling something on their left side that shouldn’t be there. It’s a general feeling of discomfort and can affect eating and sleeping habits. If you start feeling pain on the left side of the abdomen, right under the rib cage, then it’s time to see the doctor and have your self tested. Why Does Passover Last Eight Days?